"Have You Filled A Bucket Today?" Throughout the school year, staff at Page Hilltop school are spreading the idea of bucket filling. School counselor Betsy Dolan and School Psychologist Kathy Kenyon read this Bucketfilling book every fall in addition to follow up books on empathy and kindness. "Have You Filled A Bucket Today" explains to the reader/listener how we all carry an invisible bucket and this bucket has one purpose. Its purpose is to carry all our good feelings about ourselves. Our buckets are filled when someone says or does something nice, and we fill others’ buckets by saying or doing something nice to people around us. 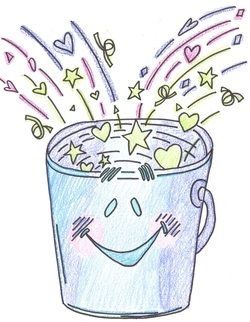 Bucket filling is the secret to being happy. Children learn that when they are nice to each other they fill their own "buckets" at the same time. 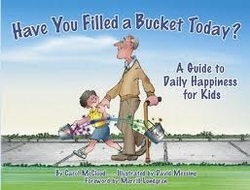 Students have also learned the difference between a “bucket filler” and a “bucket dipper”. Bucket dipping is saying or doing a mean thing. Bucket dipping takes good feelings away from someone else's bucket and is the not the way to happy living. Lastly, "keeping a lid" on your bucket, teaches children to protect their "good feelings" by keeping a lid on their bucket. Children learn strategies to use when a peer is not nice, such as walking away or talking to a trusted adult. During family time, try asking your child what they did this week to fill someone's bucket at school. Encourage your children to show you examples of bucket filling at home too. If your child was absent the day the book was discussed, have them ask their teacher for a check in with Mrs. Dolan or Mrs. Kenyon to read or borrow the book. This will be a topic we visit at the beginning of each year, and encourage children to think about bucket filling throughout the school year.